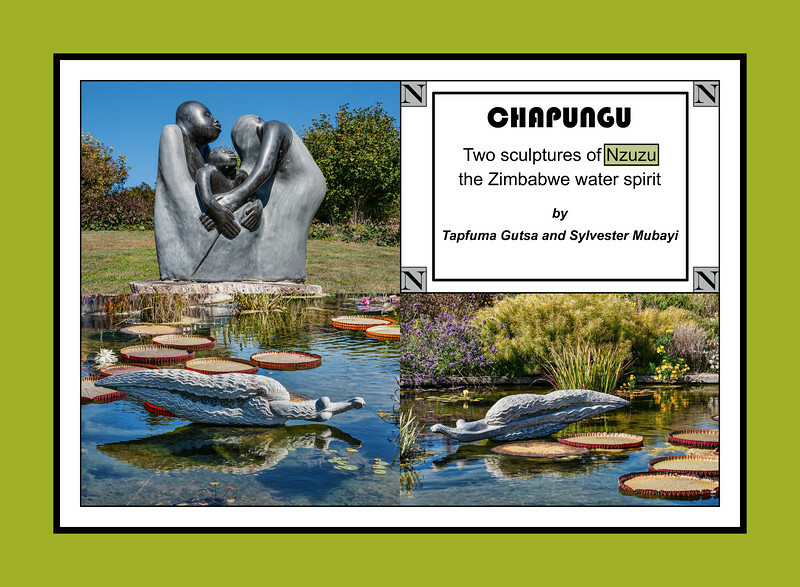 Both sculptures depicted are from the ‘Chapungu’ exhibition that I photographed in 2008 at Powell Gardens, Missouri. The two artists have taken very different approaches to depicting or realizing a form for Nzuzu. The sculpture in the upper left, ‘Nzuzu Returning Child’ shows Nzuzu (on the right) in roughly human form, but with no face. The two lower panels show Nzuzu as a blend of human and non-human characteristics. The individual photos (newly edited or re-edited) and the montage itself (created in September 2018) are copyrighted by Elizabeth Jean Jacob, with all rights reserved.